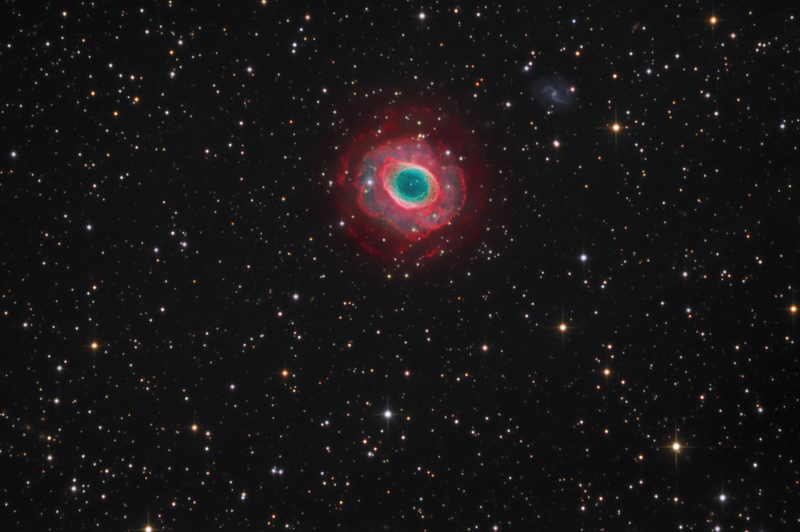 Explanation: A familiar sight for northern hemisphere astronomers, the Ring Nebula (M57) is some 2,000 light-years away in the musical constellation Lyra. The central ring is about one light-year across, but this remarkably deep exposure - a collaborative effort combining data from two different telescopes - explores the looping filaments of glowing gas extending much farther from the nebula's central star. Of course, in this well-studied example of a planetary nebula, the glowing material does not come from planets. Instead, the gaseous shroud represents outer layers expelled from a dying, sun-like star. This composite image includes over 16 hours of narrow-band data intended to recorded the red emission from hydrogen atoms, but the pronounced blue/green color is due to emission from oxygen atoms at higher temperatures within the ring. The much more distant spiral galaxy IC 1296 is also visible at the upper right. I think they should name it "Eye of Sauron" in homage. "Big Brother" might also be another choice for it, as well. In the US we call "Big Brother" a different name... Homeland Security. I know it is just the paranoia talking, but I think that within 10 years if the US Homeland Security department continues down the path it is, then we will be seeing those Heinlein-esque posters & adverts about each citizen having to do their part.